1. 7 pounds(lbs) red Potato, peeled, boiled, cooled. 2. 12 ounces celery, diced. 3. 3 ounces pimientos, diced. 4. 3 ounces onions, minced. 5. 4 eggs, hard boiled, chopped medium. 6. 1 ounces parsley, chopped. 7. 1/2 cup bacon or ham fat, cracklings, drained. 8. 1/2 cup sweet relish. 10. 1/2 cup vinegar, cider. 11. 1 tablespoon sugar (variable) salt and white pepper to taste. 12. 25 iceberg lettuce cups. 1. 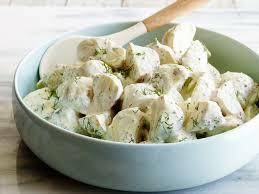 Slice or dice the cold boiled potatoes and place in a mixing container. 2. Add the remaining ingredients, toss gently, so the potatoes will not become broken. 5. Place a mound of the salad in the center of each lettuce cup. 1. 1 #10 can kidney beans, drained. 3. 1-pint celery, small dice. 4. 1/3 cup green onions, minced. 5. 3-ounce pimientos, small dice. 6. 12 eggs, hard boiled, diced. 7. 1-pint mayonnaise salt and white pepper to taste. 1. 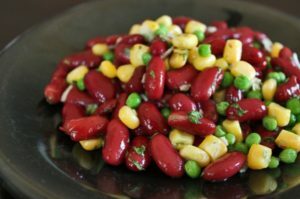 Place the drained kidney beans in a mixing container. 2. Add the relish, celery, onions, s and pimientos, and half of the hard boiled egg mayonnaise. Toss gently. 3. Season with salt and pepper, mix thoroughly. 4. Line each cold salad plate with a lettuce mound of the salad in the center. 5. Place a mound of the salad in the center of each lettuce cup. Garnish the top with the remaining chopped eggs and a sprig of parsley.